Ever since humankind first had the capacity to wonder, the sight of a flying animal must have been astounding. It is intuitively strange for an animal to fly almost effortlessly when we cannot (without our technological adaptations for flight). Early humans must have thought: "How the heck do they do that? Why can't we?" 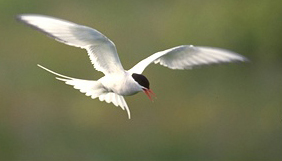 Arctic Tern. Photo by Gerald and Buff Corsi; © 2002 California Academy of Sciences. To understand flight, you must have a basic knowledge of the principles of physics, in this case categorized as biomechanics. Individuals at the UCMP and the Berkeley Department of Integrative Biology are leading experts in this field, which applies the laws of physics to organisms in an effort to understand how organisms function, and to perhaps answer questions such as : "How do organisms work?," "How do the laws of physics limit what organisms can do?," or "What can physics tell us about evolutionary possibilities for organisms?" and so on. If you particularly enjoy these exhibits, try our dinosaur speeds exhibit for a similar exercise in biomechanics. To comprehend the biomechanics of flight, a few simple physical principles must be kept in mind. First we have to recognize that air is a fluid, just like water. It is not a liquid, like water, but is a called a fluid because the force needed to deform it depends on how fast it is deformed, not on how much it is deformed (try moving your hand quickly, then slowly through a basin of water for an example). Solids are substances for which the force needed to deform the substance is dependent on the extent of deformation rather than the rate of deformation (so it takes the same amount of force to break a pencil quickly as it does to do it slowly; try this with a pencil that is devoid of sentimental value to you). As is common in nature, there are subtle gradations between the artificial dichotomy of fluids and solids; we have given you a generalized definition for each of the two ends of the continuum. We'll use "fluid" interchangeably with "air" here, and "object" interchangeably with "animal." Drag is a force exerted on an object moving through a fluid; it is always oriented in the direction of relative fluid flow (try running against a high wind and you'll feel drag pushing you back in the direction of relative fluid flow). Drag occurs because the fluid and the object exchange momentum when impacting, creating a force opposing the motion of the object. Drag is higher when (1) the surface area of the object exposed to the fluid flow is higher, (2) the object is moving faster (or the relative fluid flow is faster), and (3) the fluid has more momentum, or inertia (the viscosity and density of the fluid are high)  this is generally low for air relative to other fluids such as water. Trying to walk in a strong wind will demonstrate drag for you. A dropped weight falls faster through air than through honey largely because of drag forces. Lift is another force exerted on an object moving through a fluid; it is generally (but not always) directed upwards (perpendicular to the drag force), opposing the weight of the animal that is pulling it down to Earth. In animals that generate significant lift forces (like true flyers), the angle of the wings against the flow of air creates a resistance that has the net effect of moving the wing (and the animal) upward. The majority of lift in gliders and flyers is produced at the proximal part (base) of the wing, where the wing area is largest. Lift is higher when (1) the area of the bottom of the wing is larger, (2) the animal is moving faster, and (3) again, fluid viscosity and density are higher. Thrust is the third force that we will discuss. It is only present in true fliers; it is produced by powered flight (wing flapping), especially at the distal (end) of the wing. Thrust is a force induced in the direction of the animal's flight, opposing the drag force. To fly at a steady speed in a completely horizontal direction, an animal must generate enough thrust to equal the drag forces on it. Thrust is produced by flapping the wings (describing the shape of a figure-eight if viewed from the side), which creates a vortex wake that has the net effect of pushing the animal forward. Different kinds of wakes are formed in slow flight, fast flight, and bounding (or intermittent) flight, which you can often see in birds such as goldfinches. If the thrust force is greater than the drag force, the animal will accelerate; likewise the animal will decelerate if the drag is greater than the thrust, and when thrust force equals drag force, the animal moves at a constant speed. Thrust is a force basically dependent on the power output of the flight muscles of the animal. Now, you might ask, how do drag, lift, and thrust apply to true flyers? What sorts of strategies should animals use to do the things that they want to do best while moving through the air? Gliding and parachuting strategies will be discussed in the next exhibit. Here we'll just discuss true flight and soaring. Flight: Drag forces should be minimized for fast flight; streamlining is a good way to do this (gives a lower surface area exposed to the fluid flow). Since drag increases rapidly with flight speed, however, drag will always be limiting. Drag is very helpful, however, when a flying animal is trying to slow down or land; so in that case, animals spread out their wings (turning on the air brakes, so to speak). Lift is incredibly important to a flyer; to keep airborne, it must have forces holding it up, or its weight will pull it down. So body weight must be minimized (critical!). Flapping the wings quickly or moving quickly generates lift well, as does having a large wing area. Thrust is also a vital force for flyers; without it, the drag forces would slow the animal down enough to reduce lift forces (i.e., down we go!). Having large flight muscles is a good way to produce thrust. Soaring: A problem now presents itself: If an animal is to get large and still fly, how does it overcome the high weight and drag forces that large size entails? Larger flyers can have disproportionately larger wings; that's one major strategy. Then there is the problem of thrust: muscle power output (= thrust) increases slower than weight and drag do, so there is a limit to how big a powered flyer can be. At large sizes, soaring is the only energetically efficient possibility  the animal would have to flap its wings too quickly and burn too much energy to keep airborne if it was only a powered flyer. Happily, soaring is best for large animals, since they have low wing loading  large wing areas relative to their weight, which maximizes lift. Since it involves very little wing flapping, soaring is energetically efficient  all a soarer needs to do is stay alert, and it can stay aloft almost indefinitely. 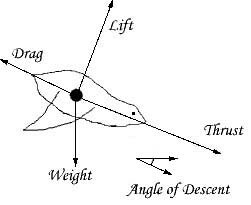 The treatment given here to the biomechanics of flight is cursory at best; for a less simplified description of the physics of flight, we highly recommend such books as "Life in Moving Fluids" by S. Vogel, or "Animal Flight" by C. Pennycuick.